We spent 25 hours researching and testing over 20 different pairs of baby socks and found that proper fit, style, and stay-on power were the most important factors for consumers who were shopping for baby socks. Kakalu Assorted Non Skid Baby Ankle Socks scored high marks in all categories and is our overall top pick. These cotton/nylon socks are super soft and have anti-slip features as well as good elastic to help them stay on even when the baby is kicking their feet. These breathable knit socks are available in a large array of designs to please any fashion-conscious parent. If you’re tired of purchasing socks that slip right off your baby’s feet even when they are just lying in their infant seats take heart because there are some great socks on the market to choose from. Many socks are loose and don’t fit little feet properly so you can easily lose one without even realizing it. With all of the different types of baby socks available, it can get really overwhelming trying to figure out which ones to choose for your baby. We have reviewed three of the top-rated baby socks on the market so you can see their features and benefits for yourself. All three of these baby sock selections are made from quality materials that are designed to fit great and stay on. We have also included a buying guide below that will help you learn what to look for in a great baby sock and how to sort through all of those choices and make a confident decision on the right baby socks for your little ones. Every parent wants the best for their baby so finding the right socks is an important task that all parents go through at many points in their child’s life. This guide and the reviews we have provided are designed to make the process stress-free and much easier. It is always a good idea to choose your baby’s socks carefully. No one wants to waste money on socks that will lose shape quickly, constantly fall off, and overall become a pain to deal with. By looking at all the information we have provided, you will be on the right track to choosing socks that you will love. Kakalu non-skid baby socks are made from a blend of 5% nylon and 95% cotton for socks that are comfortable and well-fitting. These cute little socks will keep your baby’s feet warm and protected in all weather and have beaded bottoms for non-skid safety once your baby starts walking. These stylish and well-fitting baby socks are available in several sizes that are perfect for babies 1 ½ – 3 years of age. They have great elastic, have great grip, and are stretchy too. The breathable material keeps your baby’s feet comfortable in warm weather and warm in cold weather. They easily absorb sweat and are odor-resistant too. This adorable set of baby boy’s socks from Trumpette has everything you’re looking for in a baby sock. With over 20 years behind them in baby fashion, these socks will provide protection and warmth for your baby’s feet. They are made from a durable cotton blend that is soft to the touch and will last a long time. The elastic top and closure of these socks prevents slippage that is common in lesser quality socks and the grips on the soles made of rubber provide plenty of traction to prevent your little one from slipping. These quality socks are available in a large variety of colors and designs to match any outfit your baby has. These quality unisex baby socks from Jeffries feature non-skid bottoms, stay-on cuffs, and are made from premium cotton that is super soft and perfect for a little one’s sensitive feet. The anti-slip bottoms are great for when your little one starts pulling up and taking those first steps. The ribbed cuffs support your baby’s feet and ankles without being too tight and have deep heel pockets so they stay on without problems. The material blend in these adorable socks consists of 17% polyester, 3% spandex for stretchiness, and 80% cotton for the ultimate softness. There is a boy’s multi-pack in shades of blue and grey and a girl’s multi-pack in pretty pastels. The three top-rated baby socks we have featured above are all examples of the kind of quality socks you want to purchase for your baby. All three selections are made from quality materials that surround your baby’s feet in comfort that will bag and slip off while they are playing, crawling, walking and even running. Part of what makes these socks so good is the blend of materials that are used in the creation of these socks. The right material blend will give the sock just the right amount of stretchiness and fit so they don’t lose shape or get baggy and loose while your child is wearing them or after many washings. Taking the time to find out what makes a quality baby sock will enable you to choose the kind of quality socks that will last and not cause you to end up with a pile of single socks from all the ones that fell off during play. 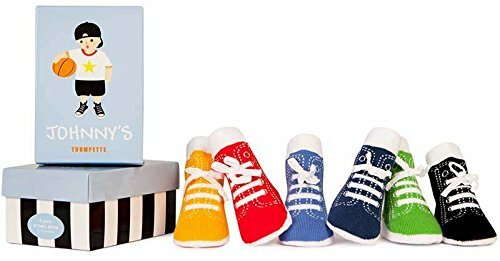 Once you are ready to purchase baby socks for your baby starting with the three top-rated selections we have reviewed above is a great place to start. If you do not see what you are looking for in those three selections we have added 7 more for you to consider. Baby socks have many uses but mostly they are to keep your little one’s feet warm in the cold and provide comfort and protection. A baby can lose a lot of body heat through their feet so it is important to pay attention to this piece of clothing and make sure they are quality socks that provide everything you’re looking for. Purchasing the right socks for your baby can be really difficult since most socks come in ranges. 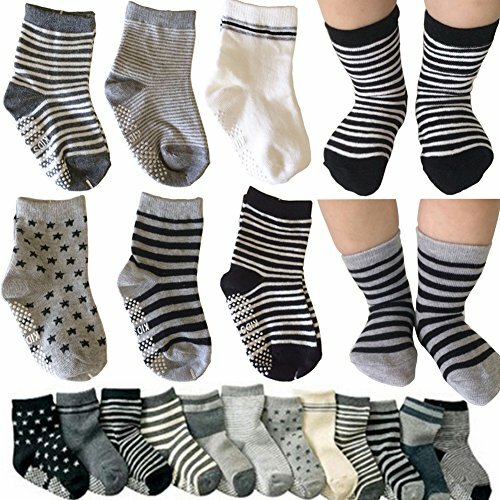 Most baby socks are sold according to the age of the baby and not the size of the feet which usually means babies with feet that fall toward the small end of the range might have a bit of extra room in the socks and babies with larger feet will fall toward the opposite end and have less room. Do the best you can to find the right size based on your baby’s age and keep in mind that different brands of socks may have different sizing/age charts to consider. It is better to have socks be a little too large than too small to prevent any cutting off of circulation from the socks pressing tightly into the skin. If you take your baby’s socks off and there is an indent all the way around their legs the socks are probably too tight. Tight socks will hold the baby’s veins which can prevent good blood flow to the lower legs and feet. This can eventually lead to numbness and a slew of other problems later on. If your baby is constantly pulling their socks off you may want to make sure that they are not doing it because the socks hurt. When it comes to finding the right baby socks for your little one there are several features you want to look for. We have listed these features below so you know exactly what to look for when you start sorting through all the different styles and brands of baby socks. Comfort – Comfort is going to be more important for a little one that is already standing and walking but you want the socks to be comfortable for the child regardless of their age. Softness is the main thing to look for when it comes to comfort. Cotton and cotton blend socks are usually ultra-soft and feel good on the baby’s feet. There are thinner styles that are made more from nylon that may not offer the same comfort so keep this in mind when shopping around. Durability – When a parent purchases clothing for their children they want those clothes to last and that includes socks. When a baby is very young, before they start walking and running, socks will usually outlast their fit. Once a child starts getting up on their feet, cheaply made socks will wear out and get holes in them. Look for socks that have reinforced toes and heels once the babies are walking and look for durable materials like cotton and nylon. Material – The material your baby’s socks are made of plays a big part in how comfortable, durable, and long lasting they are. As mentioned above you want to look for socks made of 100% cotton or cotton blends with nylon and/or spandex. They type of material used to make the sock also plays a part in how well the socks perform and hold their shape. Some materials will even determine the safety of the sock. There are some materials that have chemicals that are used in the manufacturing process. Considering that many babies love to chew on their feet, you don’t want socks made with these chemicals in your baby’s mouth. Other factors that materials determine include the breathability of the socks (cotton breathes more than polyester), the moisture-wicking ability of the socks and other things. You can count on cotton socks to be comfortable, soft, breathable, chemical-free, and hypoallergenic. They are also odor-free. The downside of cotton is that it shrinks and gets wet very easily. Polyester on the other hand is very durable and does not shrink but holds odor and is not always very comfortable by itself. Determine what kind of socks you’re looking for and for what purpose and that will help you decide which material to focus on. Design and Style – There are hundreds of designs and color combinations available when it comes to socks for babies and kids. The design choices and color selections are endless. It is pretty much a matter of personal preference what style you choose for your baby’s socks. Many parents choose socks that match the color of their outfits while others love cartoon characters or animals. There is of course the classic white socks too which go with everything but can become stained pretty quickly especially if your little one is walking and loves to run outdoors in sock feet. With all of the different designs, colors, and styles available you could be choosing designs for a long time so go with what you love. When they get older you can let them choose more of what they like but you will already know how to find the best quality to steer them toward. Washability – Ease of cleaning is always important when it comes to clothing for babies and kids. Certain materials are much more washable than others and will release stains fairly easily. Detergents are pretty strong now too so you can always use these special stain removers that are designed for kids’ clothing to get them clean. Breathable – Having socks that allow airflow is important for many reasons. Hot, sweaty feet can become really uncomfortable and odor can start. Breathable fabrics will allow the air to get to your baby’s feet so they stay comfortable and relatively dry. Having breathable socks will prevent problems like odor, athlete’s foot, and other problems from occurring. Safety – Safety is very important when it comes to socks for a little one. Children are always in high gear so running through the house is a common occurrence with most children. One of the ways socks can provide safety is by having grips on the bottom of the socks. Some socks have these little rubber grippers all over the bottoms and other styles only have the grips on the heel and ball of the foot. These anti-slip grips add some traction to your child’s feet when they are walking on hardwood or tile floors or coming down stairs. The other way socks can add safety is by protecting your child’s feet from the elements. In cold weather, socks can provide warmth and comfort especially when walking around on the cold floor. Since many parents take their babies out without shoes, having a pair of socks on in that kind of weather can make a difference in the comfort of their little feet. Elasticity – The elastic content of your baby’s socks will determine how well they fit and their ability to stay on the baby’s feet. You want to have good elasticity so the socks will give a bit with the child and allow for their fast growth. A sock that is stretchy just feels better although some of the lesser quality socks tend to lose shape when there is a lot of elastic present. There will be a lot of things about your baby’s socks that will be up to personal preference including color, style, design, length, and whether the socks have anti-slip features or not. Never choose socks based on price alone. Cheap socks are just that…cheap. They will wear out quickly, stain easily, and not feel very good on your baby’s feet. On the flip side however, don’t choose socks simply based on brand and price alone. It is better to look at the overall picture of the socks you are interested in and make a decision on the socks that check all the boxes rather than just the price box. Just because a sock looks good doesn’t mean it IS good. When checking on the quality of baby socks the best way to get some inside information is to turn to the customer comments and reviews. People are more than happy to share their experiences with products they buy so you can learn a lot by reading what they have to say about the baby socks once they have put them on their baby’s feet. If the customer comments include positive reviews on durability, the socks stay on well, and the baby loves them, you have a definite contender. 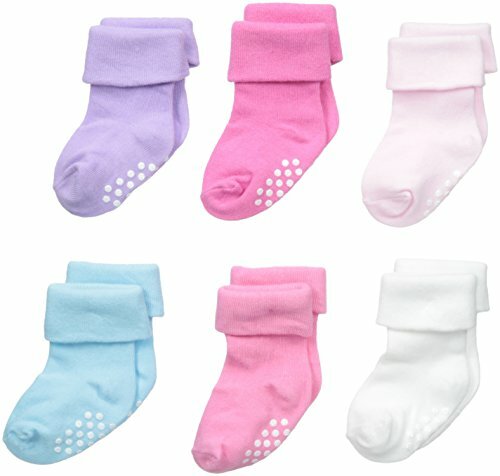 Baby socks are one of the most important items of clothing you will purchase for your baby. It is also an item of clothing that you will continue to buy as they grow and get older. To find the right pair of baby socks you want to concentrate on key elements that will give you the kind of quality and longevity you want. When a baby is very young it is highly unlikely that the socks will wear out before the baby grows out of them. Even though your baby won’t wear the socks out you still want to be sure that your focus on quality, comfort, durability, and breathability. Once your little one starts walking it becomes important to factor in safety in the form on anti-slip bottoms and breathability so airflow gets to the feet. The three top-rated baby socks we have featured above are all great examples of the kind of socks you want to purchase for your baby. Each of these three selections is made from quality materials that will provide everything you want in a baby sock. If you are looking for a fast solution to your baby sock needs, you can choose any one of these three choices and have your baby socks on the way. If you want to do more shopping around before deciding, make sure you take all of the information we have provided for you in the buying guide and apply all you have learned to your shopping experience. Remember to pay attention to the materials used on manufacturing, get the proper size and fit, and enjoy choosing from a large variety of designs and colors. All of this helpful information will ensure that you can make a confident decision on the baby socks that will be perfect for your little one and provide everything you want that will keep their feet comfortable and safe.